This is part 2 in a series on the way my understanding of certain term used in the bible and in Christianese has changed and how that has affected my faith. You can read the first part here. In the previous post, I looked at what I have been learning about the meaning and purpose of the Church and the Kingdom. I used to vaguely consider these simply other words for Christianity, but I have come to think of these as very distinct. The Church has the specific purpose of nurturing, training, and preparing people to follow Christ, and ultimately model the community that should arise from following Christ. The Kingdom is the actual actions of following Christ. In this post, I want to consider a few other terms, and how they relate. Within scriptures, the word “Christianity” is never actually used, and other forms, like “Christian” are only used a few times. There are instead several other words that are used that are applicable to our concept our “Christianity”, and I wanted to try to describe my understand of these distinct words and concepts. This is the most simple and straightforward description in scriptures for the collection of people that believe in and follow Christ. This is probably most analogous to what we mean when we say “Christians”. “The Way” was the initial term that Christians used to describe their religion. This term obviously emphasized the teachings of Jesus as a distinctive “way” of living. In Acts, it is reported that they soon started to be called Christians by outsiders. The Christians didn’t seem to object to this, and as the early church increasingly understood and formulated the divinity of Christ and His centrality, the name seemes fitting, even though it was rarely mentioned in scriptures. If you look up all the references to brothers and children of God, they seem to exclusively refer to believers. However, it can be easy to recognize the object of these terms, but miss the meaning. If we take these terms to be nothing more than a synonym or replacement for believers, this would seem to suggest that the Bible uses these words as a code word, to obscure the meaning, rather than using the clearer term “believer”. But of course these terms aren’t intended to be obscure, but rather add meaning. So while the object of these words is the believers, the descriptive meaning that these terms add to the reference to believers is to describe a familial, relational connection between believers with each other and with God (which builds our understanding of the Church and the Kingdom). When we see these terms we should recognize that scriptures is pointing us to a relational element (and not just a code word for believers). Again, the term “Christianity” doesn’t appear in scriptures, but I was comparing other words with it, so it seems worthwhile to try to define this as well. Being more colloquially originated, Christianity has come to mean more of the culture of Christians. Christians certainly do have their own sub-culture, with certain language characteristics (Christianese), worldview, ideologies, and traditions. However, not only does the term “Christianity” not really have a Biblical origination, but the sub-culture, like any other sub-culture is often a mix of perspectives and ways, some that are redemptive, and some that are in opposition to Christ’s teaching. Christianity, as a culture, needs to be transformed and redeemed by the Kingdom of God, just like every other culture. Perhaps another helpful way of distinguishing between the Kingdom and the Church is to look at their Old Testament precedence. For the Kingdom, the precedence is found in the theocratic kingdom represented by the Davidic line of Kings. The Davidic succession of Kings found its ultimate fulfillment in Christ as the ultimate King of the Kingdom. And their battles they waged, in their partial understanding (Col 1:25-27), are representative of the real battle that was to be revealed. For the church, finding the precedence might seem a little harder. Conventantal theology sometimes is described as treating the church as a successor to Israel. While I definitely affirm conventantal theology (that there is no distinct spiritual category of people with obligated blessing based on ethnicity, Matt 3:9, which clearly contradicts dispensational teaching), the church as a successor isn’t quite precise. According to Romans 9:6-8, it is the believers, the children of God, that are the true heirs of Israel. It might also be tempting to compare the Church, or at least its ministers, to the Aaronic or Levitical priesthood. This is also misguided. The purpose of this priesthood was to act as a mediator between the people and God. The necessity of this function was decimated at the cross, when the veil was torn, and all believers were effectively made priests, with direct access to God. This also means that the associated rituals of the Aaronic priesthood, like animal sacrifices, a temple, and required tithes do not carry forward to the church. However, finding the precedence of the church in the Old Testament is actually much easier than searching for metaphors. Why? Because the church is actually frequently referenced in the Old Testament. Now, of course, this may sound like a bizarre claim, as you probably have never seen the word “church” in the Old Testament. But, that is because you are reading an English Bible, and an artifact of English translation is the Hebrew equivalent word is traditionally not translated into “church”. However, the Hebrew word that is most equivalent to “church” or “ekklesia” is the Hebrew word “qahal”. And this Hebrew word for church (and it is varying forms, including a verb form) not only is mentioned in the OT, it occurs over a hundred times in the Old Testament (and even in the Septuagint, this is typically translated to Ekklesia, and occurs 80 times there). If you want to see the church in the Old Testament, just look for this word, which is typically translated more literally as “assembly”, “congregation”, or in verb form as “gather”. Now, I would certainly affirm that, thanks to Paul’s epistles, the church is much more fully developed in the NT, but it certainly is present and described in the OT. In response to my first post, a friend asked how (mis)understandings in these things work themselves out (for good or ill) today. This is a great question, and I don’t really have a complete answer. I wrote this post more to try to wrestle with the relationship and responsibility of these different aspects of God at work in His people. As a church leader, I feel it is important that I try to understand this. However, to take a rough stab at how a lack of distinction in these concepts might affect our thinking, I will offer this: I think we have tried a little too hard to make our virtuous efforts be tied to a Christian source. My assertion would be that when we pursue helping the poor, social justice, or evangelism, that there doesn’t need to be a church banner flying overhead, because the church isn’t and doesn’t need to claim direct responsibility. God will be glorified by these actions, (eventually), even if the immediate audience isn’t aware. This may diminish the church in one respect; in terms of our expectation of its direct capabilities. However, I think this (greatly) magnifies the Church in another respect. I like to characterize the role of the Church as a catalyst, and a catalyst can often trigger something that is orders of magnitude greater and larger than the catalyst itself. The Church has, can, and will continue to plant seeds of change that permeate and grow far beyond what the individuals themselves could ever accomplish. Through the Church is a thrilling and amazing potential! Lowly followers of Christ, by gathering to disciple and encourage, have triggered new patterns of living that have rippled through generations and have truly formed and shaped the world we live in today. We can and should legitimately hope to see our gatherings do the same today and tomorrow. Believers are called to periodically come gather together, like a family, relationally and lovingly, to train, nurture, equip, encourage, and prepare each other for following Christ’s way, that we might live our lives (not only inside, but outside the church) obeying the ways of the Kingdom, showing the way, like a catalyst, for transformation (for all cultures including Christianity) to a new way of living. As we do this, and manifest the Kingdom of God, demonstrating compassionate, merciful, and just ways, we tear down the barriers between ourselves, and draw people to gather together in harmony, a delight to Christ, radiating as His bride, walking in ways that anticipate our future closer union and gathering as relational community with Him. If we ignore the importance of nature as a revelation of God’s beauty, we can quickly turn to an exploitative approach to nature. If we treat nature as merely a resource, a source of extraction of goods, and fail to value the preservation of the beauty of creation. If agricultural or genetic engineering is coupled with species elimination, we have are ignoring God’s design of diversity in creation. Even within technology, we can be guided by the principles of God’s creation. When we engineer for homogeneity, we are not engineering according to God’s style. If we engineer without regard for sustainability, we are not follow God’s approach. If we ignore God, the creator, it is quite reasonable to erroneously value nature for nothing more than its means of providing resources for humans. But acknowledging a creator demands that we put a value on nature as God’s artwork, something with a value worth preserving beyond just its utility to humanity. Those who worship God, should be those most invested in protecting and honoring God’s creation, yet Christians have acquired a reputation for having the least concern for our planet, our climate, and the creation that surrounds us. Likewise, this concept is important for how we treat people. We live in a world where people tend to be assessed by what they can produce, their performance. Yet God’s creation reveals beauty that goes far beyond just resource production. The beauty of creation has so many facets and intricacies that no one can be truly appreciated if only seen for their function. Likewise as we approach others, we must look for beauty beyond just productivity. We must appreciate the beauty of diversity, of the uniqueness of individuals, the wide range of gifts that God has given people. On the other hand if we ignore the important of the delegation of creation, it is easy to fall for the appeal to nature fallacy. And not only does the theology of creation teach us that the concept that God has called man to create and design, but the Bible also teaches that while nature may reveal God, nature itself is fallen (Rom 8:19-22), and natural instincts and the natural process of “natural selection” are ruthless, God has called man to step above these. I recently saw Monkey Kingdom, a great documentary of the life and society of monkeys. One thing was clear: monkeys are horrifyingly ruthless towards each other. They have brutal caste systems and the elites will hoard food and inflict horrible punishment on lower caste who attempt to break rank. The natural systems, societies, and structures of monkeys and man are broken and ruthless, God has called us to challenge these with a greater concept of society. This has implications for how we assess (or can’t assess) ethics, organization, and morality as well. While God’s design reveals His purpose, the delegation and progression of creation means that we can not hold up an image of original creation as an infallible blueprint for morality. We can’t use Adam and Eve as a definition of proper moral living. This also means we can’t assume that there are “natural” forms of economics or governance that are superior. There are no easy solutions from simple economic models or democratic structures, we are constantly challenged to think, innovate, and consider new ways of improving upon our systems. Simply letting things be is rarely the answer. Appeal to nature fallacy can lead astray in everyday ways as well. Millions flock to “natural” foods, remedies, and other products that often lack any substantial verification of superiority, and are merely marketed on the basis of being more natural. The tremendous commercial success of organic products has largely been attributed to the appeal to nature, and fear of the artificial. Where these products help improve labor practices, increase species diversity, and reduce antibiotic resistance they are to be welcome and appreciated, but the intuitive superiority of their naturalness is easily overestimated. For many, this “naturalism” distortions may simply lead to extra spending, but for others, on the edge of development, where small improvements in agricultural efficiency can provide the opportunity to properly feed one’s family, advances in genetic engineering can be a matter of life and death, with thousands of lives at stake. Distorted perspectives may not have big consequences for us, but denying the opportunities of engineering, that God has given us, can really mean life or death for others. If we are to properly respond to God’s design of delegated creation, it means that God has invited us into creation in every aspect. We can’t inconsistently assume that we can rightly engineer computer chips and attempt to actively influence people’s beliefs, while we ignore God’s invitation into creating that also extends to genetic engineering, sophisticated medical and pharmaceutical innovations as well. Likewise, environmental protection is critical to helping to preserve the beauty of God’s creation, but excessive zeal is manifested in the attitude that any and all human interaction with nature and consumption of natural resources is negative and should be avoided. Shortly after Nikki and I were married, we had the opportunity to go to Switzerland. One of the things that I was very impressed by was not only the beauty of the mountains (of course! ), but how the homes that dotted the hillsides actually accented and added to the beauty of the amazing mountain valleys. In the states it seems there is often either total take over of develop-able land, or complete protection. But in Switzerland, I was amazed at how thoughtful design can actually complement nature. God intends for man to continue to invent, dream, innovate, and create with everything from electronics to genetics, while still being guided by the principles of creation: caring and providing for for others, while cherishing the principles of beauty, diversity and sustainability. Let us embrace both of these aspects of creation. When I feel like yelling, may I whisper. When I want to push THAT person away because they are driving me crazy, may I draw them closer (maybe physically, maybe relationally). When I want to judge, may I try to look at it from their perspective. When I want to vent (aka gossip), may I keep my mouth closed. When I want to assume, may I look for the best. When I want to criticize, may I compliment. When I want to give advise, may I slow down to listen and empathize. When I want to compare, may I choose to be thankful. When I want to respond emotionally, may I consider their emotions first. When I want to complain, may I consider what I am willing to do to fix the problem. When I want to indulge, may I consider those who don’t have enough. When I want to worry, may I instead pray. I pray that this week is a week of peace, healing, and steadiness for you as well as for myself. 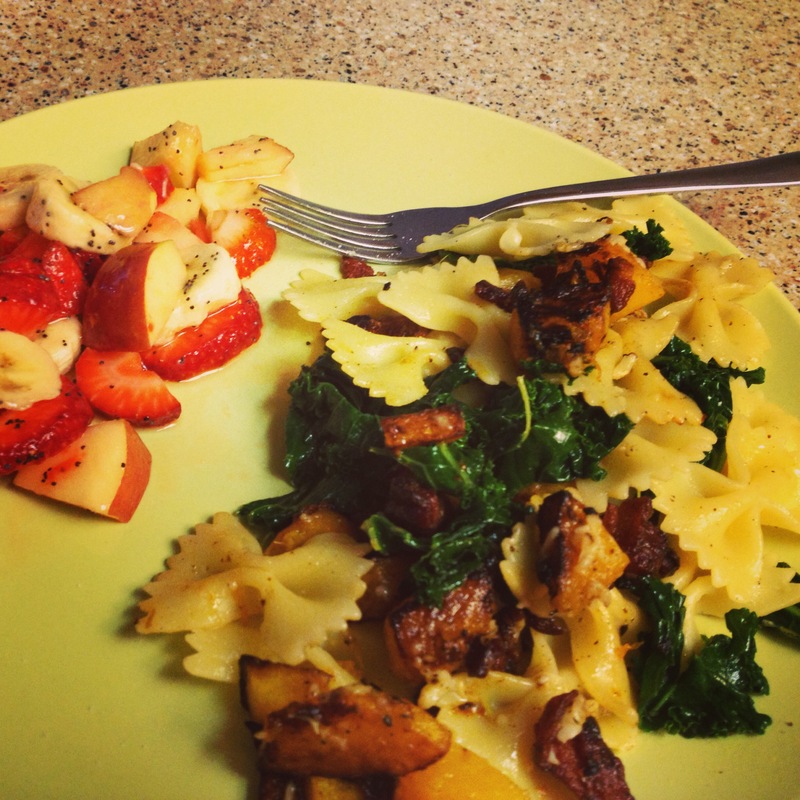 Here’s what we enjoyed eating last week. May your table be full of yummy foods and good conversations. I love this recipe because it is flexible. This time we added fresh chopped zucchini from our garden. 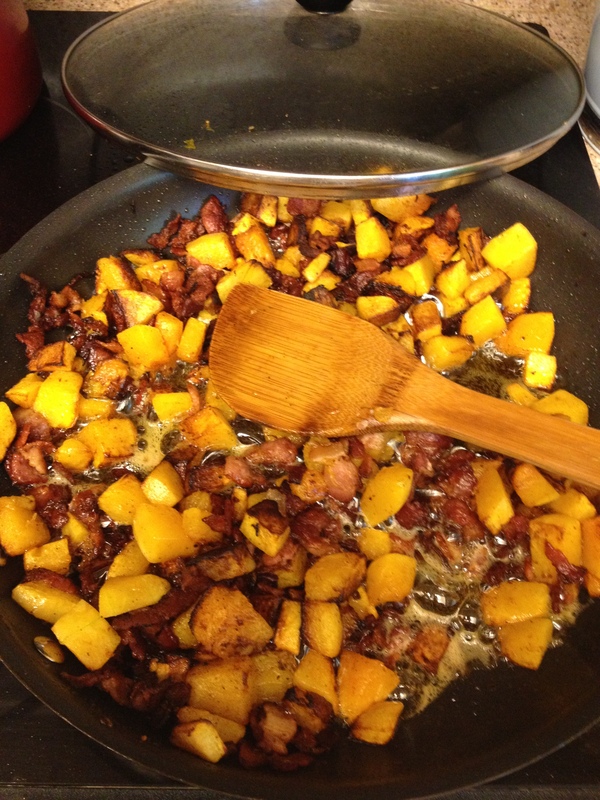 Butternut Squash, bacon, and pasta, a match made in heaven! I wrote this a couple years ago and for some reason it never made it on the blog. I was reminded of this struggle and lesson as the Halloween decorations started appearing this weekend. I don’t know why but for some reason people in Utah LOVE Halloween. So many people here full out decorate their houses, plan elaborate costumes for their kids AND themselves, and even get off work early to get ready! The haunted houses and haunted-themed events abound for the whole month of October. Because we are attempting to raise our kids to be able to relevantly relate to their culture and not just build a christian bubble around them we’ve chosen to celebrate this holiday in certain, thoughtful ways rather than just excluding it from our lives and vocabulary. We try to find ways to redeem and reclaim that which sin has darkened and perverted. So on this particular night in the past we’ve let our kids dress up and we go to the local senior center. We walk through the halls and greet the residents and talk to them. We talk to our kids about trying to bless others with their presence and I’m not gonna lie, they get a ton of candy too. I’m not saying that everybody should do what we do, it’s a personal decision that has to be made with lots of evaluation and prayer. Recently we moved to a new neighborhood. We’ve had the pleasure of meeting a lot of our neighbors and are really enjoying getting settled into our new surroundings. As this holiday approaches we’ve watched as a few houses here and there have put out hay bales, pumpkins, and the occasional spider or scarecrow. Pretty much just cute autumn stuff. Then this week it happened. Down around the corner from us the little house and well manicured yard overnight turned into an evil graveyard. Now, one of my biggest pet peeves in the blogesphere is exaggeration for poetic flair and I try really hard to write honestly and realistically. So I hesitate to say that our neighbor’s decorations are “evil” but honestly I can think of no other accurate way to describe them. These decorations are beyond the typical Halloween scary stuff you see, they are just horrible, dark and, well….evil. The first time I drove past this transformed house I shuddered, shook my head in disgust and then got irritated. I thought, I have to drive my kids past that house every day. Thanks a lot jerks! All that morning that stupid house was on my mind because I knew later that day I would have to drive past it with my kids in tow. What was I going to say when they saw it? Then an idea popped into my head, we don’t have to drive past it! There are other routes to our house. I can just use those routes until those decorations are gone. Yes, no other route is nearly as direct. Yes, I will have to drive out of the way, multiple times a day, for the next 30ish days…ugh. This is not looking like such a good solution. Back to the drawing board. So my next solution, I pray that God would blind my children’s eyes to this house for the next month. God, you can do that right? I’ve heard stories of bible smugglers in other countries who have watched in amazement as police have searched their bags and literally not seen hundreds of bibles and study materials. So God, please blind my children’s eyes to these decorations so I don’t have to deal with them seeing them and don’t have to drive out of my way. “MOM!!! DID YOU SEE THAT HOUSE!?!!? I look in the rear view mirror and see all three kids with their faces practically plastered to the window visually sucking in all the horrible things on display. So no blindness, huh God? And that’s what they’ve been doing ever since. We don’t drive out of our way to get home, we don’t talk poorly about those neighbors for liking that stuff, we simply look away. The more I think about it, the more I see the need for this at other times in our lives. Down the road I know there will be times when my children will need to choose to look away from something. A website, a photo in a text, a billboard, etc. There are lots of things they will be exposed do that I can’t control or protect them from. I hope this simple exercise of training their eyes will give them strength to make the right choice when the consequences are greater. I followed her suggestion and topped the chicken with bacon and cheese and broiled it. It’s worth the little bit of extra effort. This is a commune favorite, we have a fantastic dough and sauce recipe. The kids love to make their own pizzas and this meal works great on busy nights when not everyone is home for dinner at the same time. Simple, quick, and so good. I confess that I forgot to remove the huge chunks of ginger from the oil before I added the vegetables. This meant a few very surprising bites…not recommended. This is my family’s recipe and was what we always requested for our birthday dinners. My favorite part is making the noodles together. The kids love unrolling the long strands of dough and tossing them with flour before they go in the broth. We always leave one noodle rolled up and see who gets it in their bowl. P.S. It’s a short menu this week because the kids and I took a spur of the moment trip up to visit my family.